Get Your Body Back After Baby! Calling all Kauai moms! We all know how profoundly pregnancy and birth affect our bodies. Whether you had your baby five months or fifteen years ago, a basic 10 series of Rolfing can help bring you to new levels of comfort, balance, and expansion. 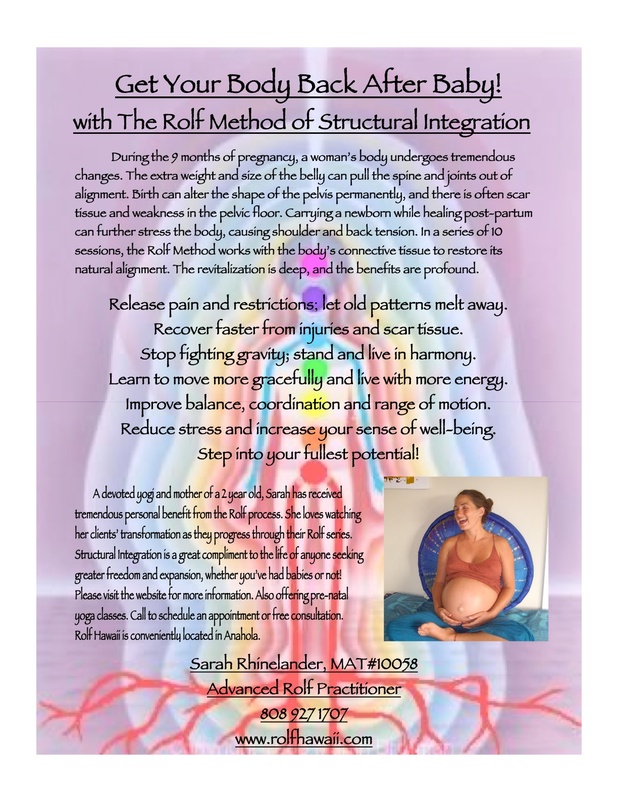 As a mother, I have experienced the profound ways Rolfing has supported my body before, during, and after my pregnancy, helping me to carry my baby easily and recover quickly post-partum. Thinking of conceiving? Structural Integration is known to help prepare the body for conception and prevent many common pregnancy related discomforts. I am happy to offer this experience to all, mothers and non-mothers alike, and encourage you to call for a free consultation. Start the New Year with a powerful gift to your Self!